In the world of trucks, it’s hard to convince one loyal truck owner to switch to another brand. In fact, most owners stick with the same brand until something catastrophic has happened to their previous truck. Knowing this, manufacturers have to make long-lasting and dependable vehicles that are not only eye-catching to previous owners, but to others that have been disappointed by other brands. 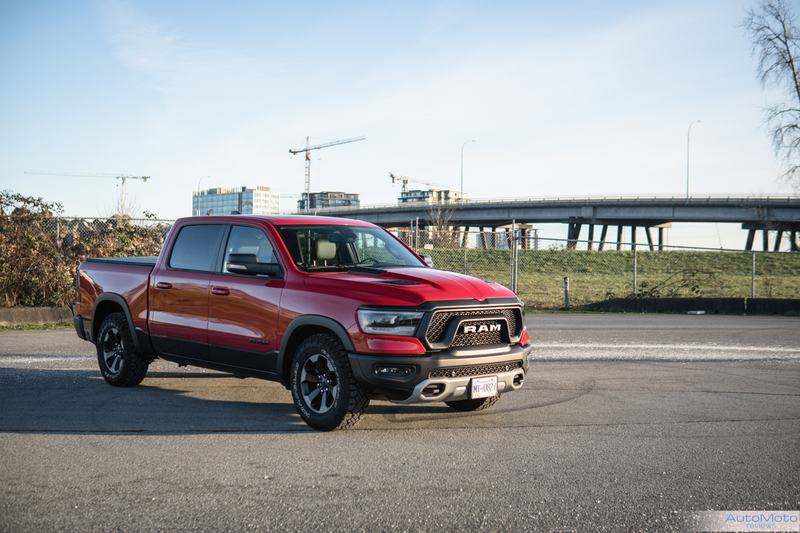 Meet the 2019 Ram 1500, Ram has pulled out all the stops for one fantastic truck, and it doesn’t need to do anything as revolutionary like it’s counterparts Ford or GM. Ram simply built a balanced truck that is well suited for most owners. From the outside, the Rebel trim looks fantastic, it’s muscular and has plenty of angles. The front end is also very distinctive, one look and it’s clear to see that it’s a Ram. The headlight design is smooth with LED low and high beam that is appealing to the eye, but also illuminates the road quite well. Sitting neatly in the centre is the Rebel’s corporate grill. 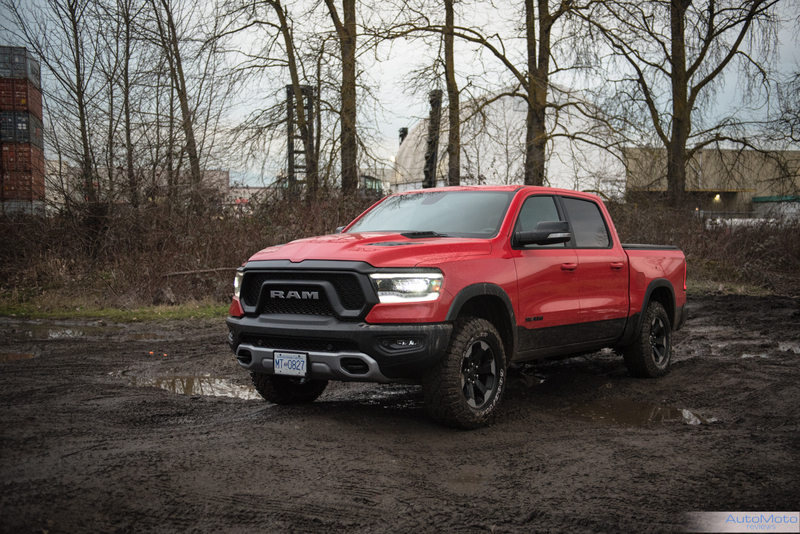 Unlike other Ram 1500s, with the usual bling and chrome, the Rebel’s black moustache grill is menacing and gives the overall truck a mean presence. This macho look goes over the hood with a bulge in the centre, marking the HEMI V8 that’s underneath. From the side, the truck features a higher stance thanks to lifted ride height and big knobby tires by Goodyear. In the back, a black bumper finishes off the rear with twin blacked-out exhaust pipes to complete the overall look. And just in case you didn’t know what truck it is, a matte black Ram logo is highlighted on the tailgate just to let everyone behind know you mean business. Moving inside the cabin, the Rebel takes a softer approach. The Interior quality is on a higher scale than previous model with softer-touch plastic throughout. There’s even beautiful contrast stitching on the dash, armrest, doors and seats with plenty of red accents to make it stand out. Directly in front of the driver sits the newly upgraded cluster with a 7″ screen. This display shows not only core vehicle temperatures, but speed and media controls. What I love most is the illuminated “Rebel” Logo in the centre – just to really tell you it’s special. 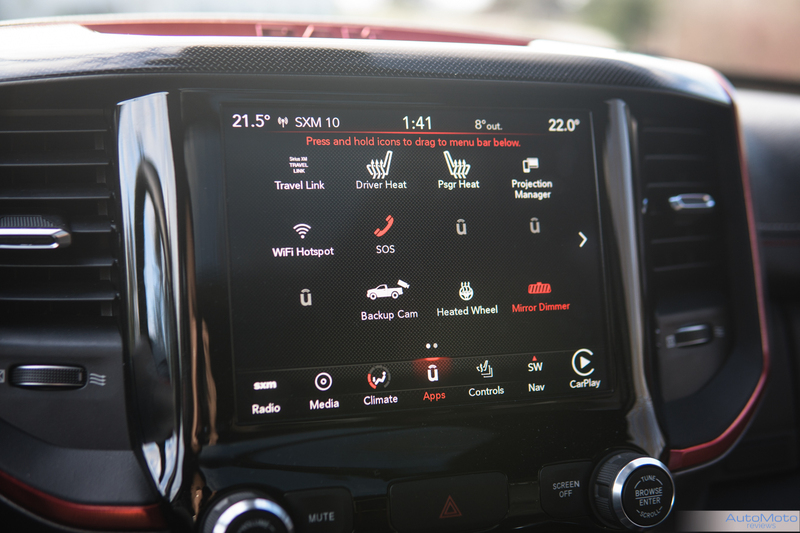 The infotainment system is powered by Uconnect, which notably works great with little to no hiccups, and it’s the same here. Standard equipment is a 5″ unit, but here we have the 8.4″ option with Apple Carplay and Android Auto – this unit does it all. The glossy screen does induce some fingerprints after a while, but the high brightness and contrast on the unit still makes it very pleasant. 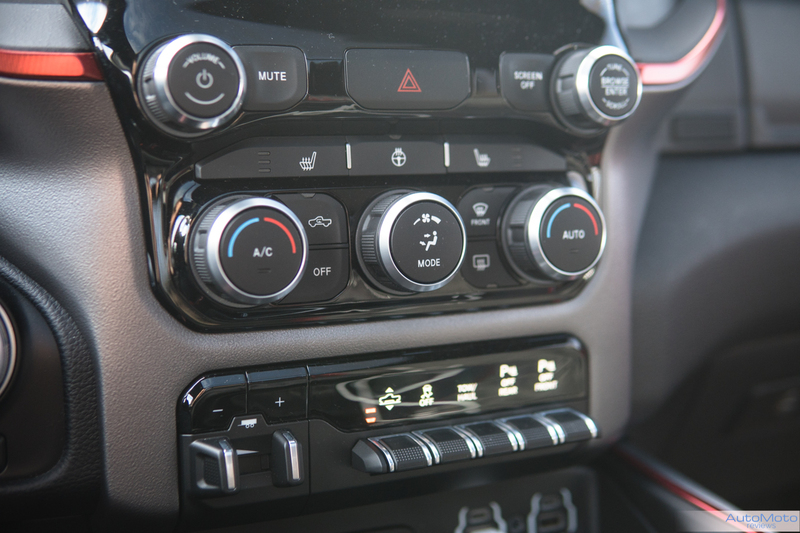 Unlike some vehicles where the touch screens take over the cabin, Ram has still left plenty of physical buttons for the radio and climate control. There’s rarely a need to dive into the menu to control the most basic of functions. Best yet, you can opt for the new 12″ display unit which will make this truck more Tesla-esque. To make sure everyone in the cabin is happy, Ram has included 5 USB-A ports within the cabin and 4 USB-C ports. There’s even a hand place within the centre console to place your device, giving you peace of mine, keeping it safe and secure. The centre console also has a household outlet, and it’s large enough to house a laptop. As for comfort, it’s lovely!.The seats are heated with an extra option for ventilation, making this seats superbly comfortable to compliment the extra wide room. I really like the tire tread design on the centre portion of the seats, it does make the Rebel more special. What’s nice is unlike most vehicles where you want to call shotgun, in the Ram, passengers will be just as happy if not happier in the back seats. With the most rear seat passenger volume in its class, rear seat passengers can really stretch out. 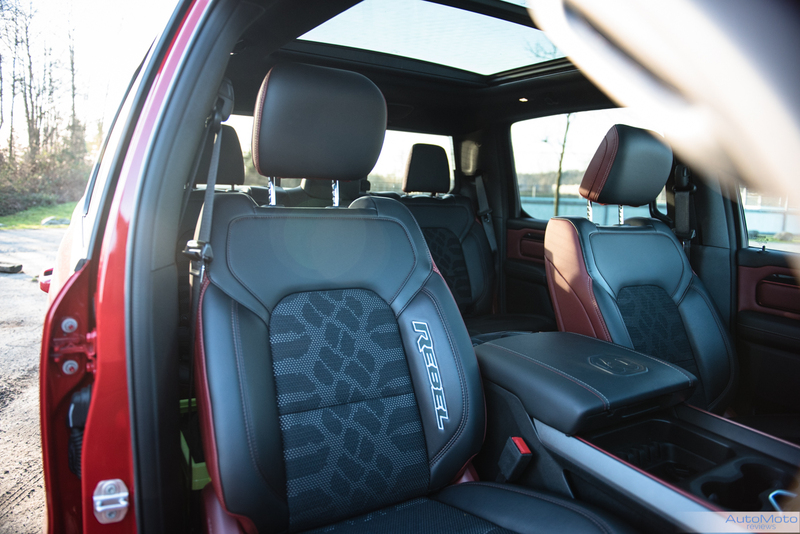 On the higher end trims the rear seats can even recline with heated seat options. Gone are the days where trucks are trucks these days, these big bruisers are just as comfortable as any luxury car. 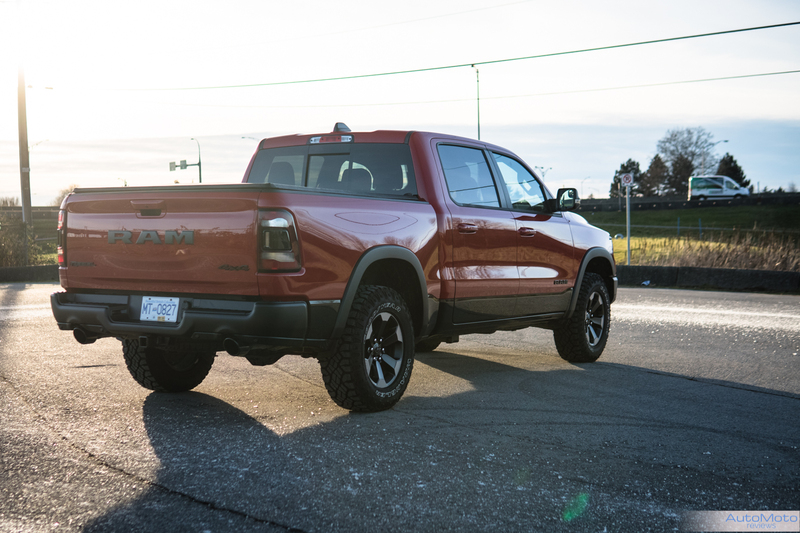 For additional comfort, the Rebel is equipped with a class-exclusive four-corner air suspension making the ride supple removing any harshness generally found with live rear axles. Under the hood, not that much as changed, there are a few engine choices to choose from the Pentastar V6 to what we have here the Hemi V8. Both can be paired with what Ram calls eTorque. Think of it as a really small hybrid system which helps boost torque and provide better fuel consumption. While it doesn’t drive the wheels directly but rather the accessory belt, it provides the V6 with 90 lb-ft and the V8 with 130 lb-ft of additional twist. The Rebel we have here is just the standard Hemi 5.7 L V8 pumping out 395 hp and 410 lb-ft of torque. While it may be enough to move the Rebel, it’s no match to the 3.5 Ecoboost from Ford or the new 6.2 L V8 from GM. What it lacks in power it sure makes up for in noise, dip into the throttle the HEMI V8 wakes up with a wonderful roar spitting up anything it chews up through the rear exhaust pipes. However, do watch how often the power is used. During our testing, I manage to get around 22L/100km within the city. Hypermiling the Rebel on the highway returned 14L/100km, a bit away from the EnerGuide figure of 16.1 City and 11 on the highway. Out on the road, the Rebel is incredibly fun to drive with limited traction, thanks to the Wrangler Duratracs, the truck is quite lively. These knobby tires are quieter than the Toyos used in the previous generation, but as off-road tires go, they do reduce dry and wet traction in favour of off-road grip. This means even with stability and traction control fully engaged, the truck can still get the rear end to step out. Normally, this type of hooligan behaviour is kept within sports cars and vehicles that tend to be more agile, but in this truck, it can put a smile on your face. The steering is communicative with enough feedback to feel imperfections across the road, and the throttle can be modulated easily to control for any oversteering that may occur. 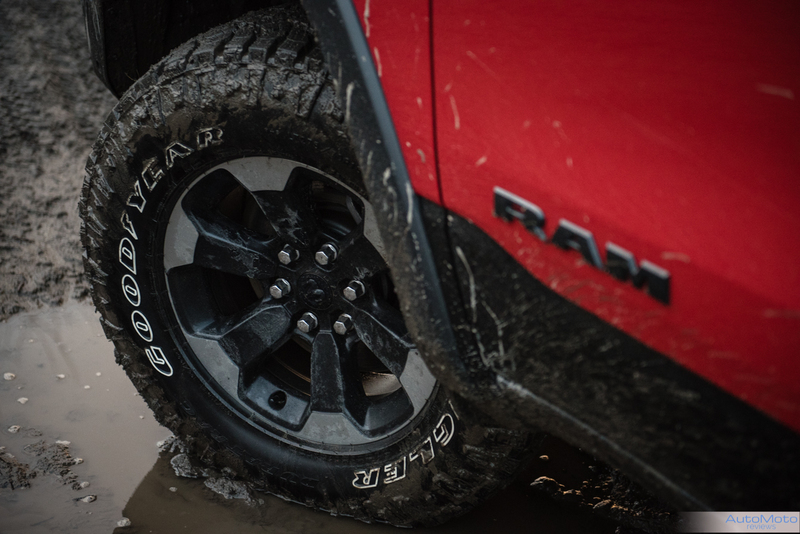 Off the paved road, the Rebel’s extra ground clearance helps it climb over obstacles with ease. 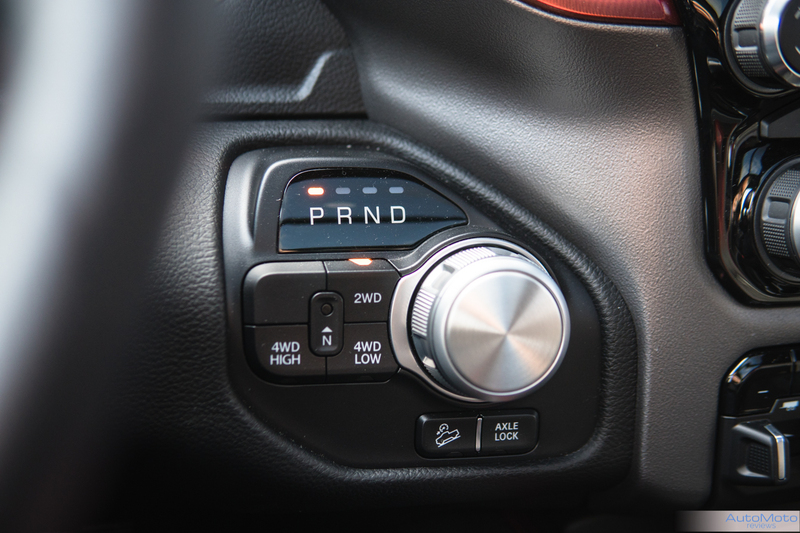 With a push of a button, drivers can engage low-range as well as the electronic rear diff lock to maximize traction where needed. Something I did like is the rear diff can be locked not only in 4 wheel drive mode, but also when in rear wheel drive. If you like playing out on the sand dunes, the Rebel can make some wonderful rooster tails. Overall the Rebel is a solid truck, with plenty of power and grace it’s sure to steal some of the competition. Price, as tested with all the options, comes up to $73,305. Yes, this is a lot, but when looking at what we’re getting, I think it’s one hell of a deal. 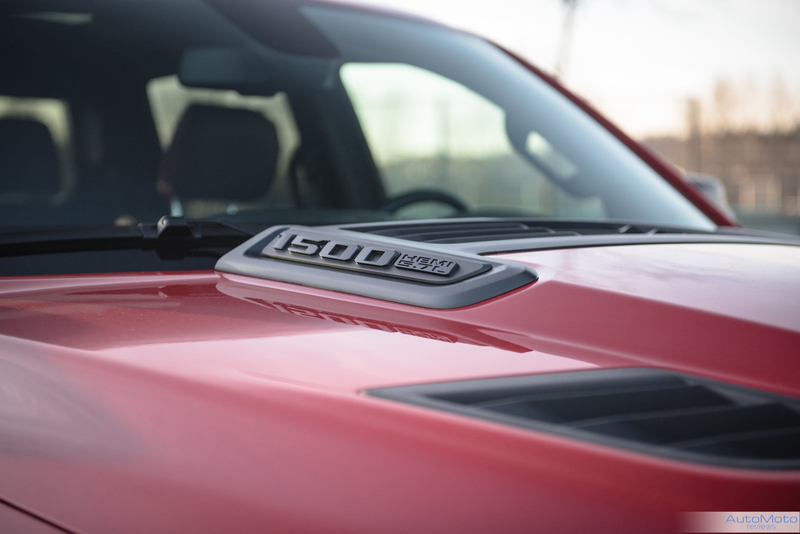 Best yet it’s not just me, Motor Trend has named the Ram 1500 Truck of the year thanks to the truck’s solid performance and interior amenities.